Wildenstein & Co., Inc., New York. Anon. sale, Sotheby's, New York, 11 May 1987, lot 58. Anon. sale, Christie's, London, 28 March 1988, lot 21. Acquired at the above sale by the family of the present owner. J. and H. Dauberville, Bonnard, Catalogue raisonné de l'oeuvre peint, Paris, 1968, vol. II, p. 328, no. 789 (illustrated). At the time the present work was painted, Bonnard was in the midst of an introspective period in which he attempted to reconcile and balance color with form. He had recently purchased a modest two-story residence at Veronnet, a hamlet in the Seine valley not far from Giverny. The house, which Bonnard nicknamed "ma roulette," my caravan, would become one of his greatest "muses," affording rambling views into the distance that gave him every opportunity to explore the tiny variations in color and light to which he was so uniquely sensible and which informed the greatest of his paintings. An accomplished colorist, his palette, earlier dominated by darker tones, now brightened. He flooded his canvases with an intense light, making works such as La Terrasse a triumph to the expressive power of color and the luminescence achieved from his study of the effects of sunlight. 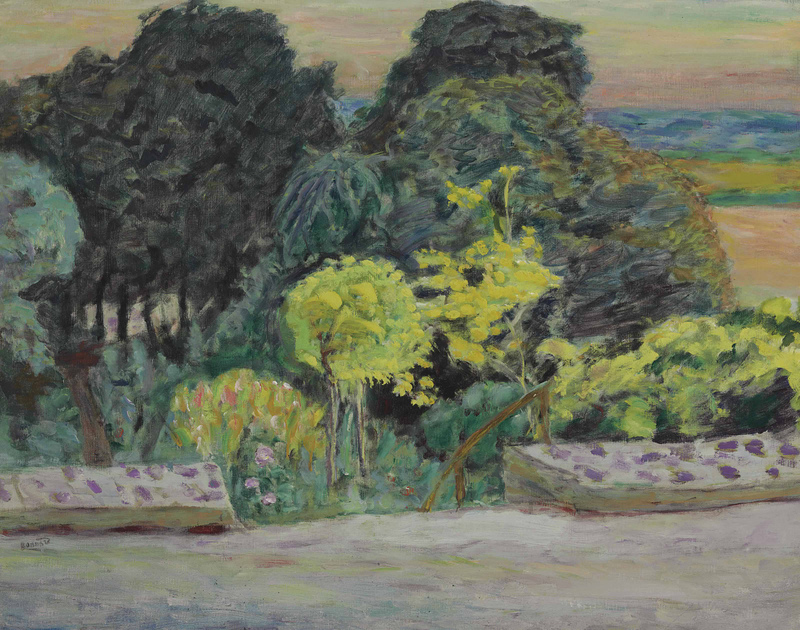 Margrit Hahnloser-Ingold offers insight into Bonnard's artistic process: "Once his inspiration has been fired, Bonnard would withdraw to his studio in order to stand back, as it were, from his models and to transpose them more freely into the world of his paintings. The point of departure--that is the initial composition--was modified, and either enlivened by details or else simplified, the proportions were distorted, the better to conform to his own particular conception, in other words, to his artistic vision" (Bonnard, The Late Paintings, exh. cat., The Phillips Collection, Washington, D.C. and Dallas, Museum of Fine Arts, 1984, p. 72). Bonnard's gardens at Vernonnet, which fill so much of the foreground of La Terrasse, were hardly tamed and deliberately rambling. He even referred to them as his "jardin sauvage," as in the title of his celebrated canvas (also known as La grande terrasse) showing another similar view and now in the Phillips Collection, Washington D.C. These compositions allowed Bonnard to reconcile his intense interest in color with the rendering of form, capturing the scenes before him with an absorbing intensity. This effect is heightened in the present work by the canopy of trees providing a gorgeous contrast to the intense yellow blooms of the trees in the foreground. The strikingly evocative clouds also serve a pictorial purpose in pushing the intense colors of the garden into bolder relief.